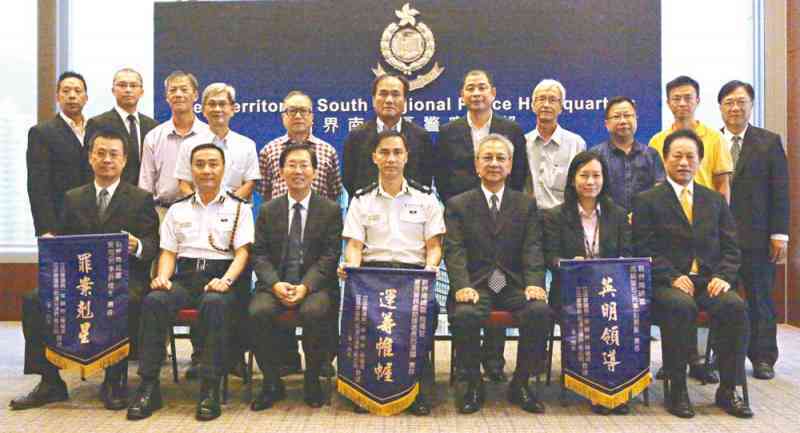 Two members of the Legislative Council, Mr Chan Kin-por (from Insurance Constituency) and Mr Frankie Yick Chi-ming (from Transport Constituency), together with representatives from insurance and public transport industries, called at New Territories South (NTS) Region on October 21 and presented banners to officers of the Regional Crime Unit (RCU) 2A for busting a champerty case involving a series of insurance fraud. The mastermind in the case was in charge of an adjuster company, who, between 2012 and 2014, was alleged to have conspired with other people in the champerty case and used forged documents to make large claims in traffic accidents from insurance companies. RCU officers investigated the case and arrested eight persons, neutralising an active motor insurance fraud syndicate. Speaking highly of the officers' detective ability, both Mr Chan and Mr Yick also complimented the Force for its performance in Operation SOLARPEAK, and encouraged Force members to do their utmost in maintaining law and order in face of a major challenge.